Chris Salthouse worked with Morrelli & Melvin to develop this 46′ (14m) high-speed tender to Emirates Team New Zealand’s America’s Cup catamaran. Service requirements include running 12–14 hours per day at 30 knots. Salthouse is also building this raised-deck in-house design, the Southstar37 (11.3m), to appeal to the gentleman’s day cruiser and overnighter market. Like similar designs built in the United States, the Southstar37 has a combined helm and deck­house that can be sealed during inclement weather. Those readers in the sail yacht racing game will know well the name Salthouse, the 54-year-old New Zealand builder of such boats as Roy Disney’s 100′ (30.5m) Pyewacket, Team Origin’s TP 52 (15.8m), and many others. The firm was in the news recently when Emirates Team New Zealand was the first America’s Cup team to launch its AC72 (22m) catamaran. These boats are capable of 40 knots, which makes obsolete the tenders that were used for the version-5 AC 90s (27m). Chris Salthouse, whose father founded Salthouse Boatbuilders in 1954, traded a crew position on the racing yachts (he’s 43 and getting a bit long in the tooth for trimming sails) for driving ETNZ’s new tender, a 46′ (14m) catamaran designed by Morrelli & Melvin (see Professional BoatBuilder No. 127, page 94) specifically for the mission of chasing the big cat around the Hauraki Gulf in preparation for the 2013 races on San Francisco Bay. Among Salthouse’s requirements for the tender: 12–14 hours a day doing 30 knots with 50-knot sprint speeds when necessary; fuel efficiency to stay out all day without refueling; and capacity to carry spare parts and personnel such as sailmakers, hydraulic technicians, and engineers. Pete Melvin drew the hulls and worked closely with Salthouse on the cabin and other features. The result is a 512-ton tender that in trials has achieved a top speed of 58 knots. 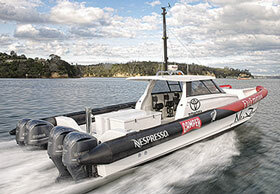 It’s powered by four 300-hp (225-kW) Yamaha F300B V6 four-stroke outboard engines. Salthouse says the four are required “because that’s how many engines it takes to right a capsized AC 72.” Two engines, he says, wouldn’t be enough. Also, towing the AC 72s requires more power, because their large solid wings, which can’t be lowered until the boats reach shore, load up. The four engines burn 26.4 gal (100 l) per hour; with 449-gal (1,700-l) capacity in its tanks, the tender can run for 17 hours at 30 knots, or 510 nm. “That’s pretty good,” says Salthouse on the company’s website. Delayne Salthouse writes about the choice of hull: “The shape we used is a hybrid somewhere between symmetric demi-hulls and asymmetric demi-hulls. Symmetric demi-hull planing power catamarans typically exhibit low vertical accelerations when operating at planing speeds. The mass of water, spray, and air forced inboard of the demi-hull centerlines helps to create a high-pressure region in the tunnel, which helps soften slamming impacts. The fineness of the individual hulls also helps reduce slamming and vertical accelerations. Salthouse is located on Auckland’s Waitemata Harbour, about 15 minutes by car from downtown. Its wharf and jetty can handle boats up to 100′ (30m), and can haul boats up to 80 tons. Facilities include 6,671 sq ft (620m2) in Building 1 and 10,760 sq ft (1,000m2) in Building 2. A Project Manager’s Cottage provides dedicated office space while a boat is under construction. 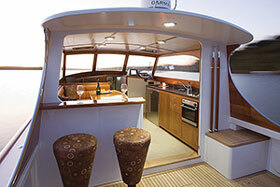 Salthouse Boatbuilders, 84 Rame Rd., Greenhithe, Auckland, New Zealand, tel. +64 9 413 9021, fax +64 9 413 9023, website www.salthouseboats.com. The schematic shows how Humphree interceptors are mounted at the transom, actuated by DC motors, and controlled at the helm. A kit includes the interceptors with servo actuators, the RC Ride Control Unit, and Bridge Control Panel. Right—For high-speed planing craft, Humphree makes a line of fixed ventilating and subcavitating fins. As much as boat owners love being at sea, much effort is made to make the ride feel like you’re not really at sea at all. The reasons are several: prevent seasickness, improve pleasure, and increase speed or, at the least, increase efficiency. Large yachts employ stabilizers to dampen roll. Small powerboats are fitted with manually adjusted trim tabs to control fore and aft attitude. A gyro applies an aerospace technology to yachting (see “The Stability of Spin,” PBB No. 113). So-called interceptors are a hybrid of several technologies with the same goal of smoothing out the ride. Humphree’s hydrodynamicists have taken a scientific approach to the challenges of ride control, noting a number of components to resistance: surface friction, surface roughness, wave resistance, form resistance, air resistance, and appendage resistance. For planing and semi-planing hullforms, they say wave resistance is approximately 50% of total resistance, and that number can be significantly reduced by intelligently controlling the trim of the boat. The conventional methods of control are: hull extension, traditional trim tab, wedge or hook, fixed interceptor, and adjustable interceptor. Shortcomings of the first two are increased surface friction; and of the next two, optimization for just one speed and one load condition. 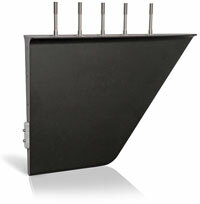 Adjustable interceptors are therefore a good choice. So just what is an interceptor? For Humphree, it is a small composite blade vertically installed at or near the transom to interrupt water flow underneath the hull. The pressure created lifts the stern. At high speeds, very little blade surface is needed to produce the desired effect. Unlike conventional trim tabs, which are usually hydraulically actuated, Humphree interceptors are actuated by a 12- or 24-VDC electric motor, thereby saving weight and enabling much faster adjustments: a full stroke in one second, with 100 steps within each stroke. In its simplest form, control is manual, with the operator making adjustments at the helm based on observed behavior of the boat. In the most sophisticated and expensive form, longitudinal and transversal trim are controlled automatically, along with active roll and pitch damping via a digital controller “with,” according to the com­pany’s website, “unique adaptive control algorithms and incorporating an integral state-of-the-art gyro measuring 3D rate of turn and accelerations.” Trim and list angle are displayed at the helm in real time. The company’s standard and extended interceptors are from 500mm to 1,500mm (20″ to 59″) wide, and penetrate flow to a maximum of 50mm and 75mm (2″ and 3″), respectively. These are intended for boats from about 40′ to 200′ (12.2m to 61m). Recently, however, Humphree introduced a downsized model, the 350mm (14″), suitable for boats from 25′ to 45′ (7.6m to 13.8m). For high-speed planing boats, Humphree also makes a line of small, fixed, ventilating, and sub-cavitating fins that improve course-keeping. They’re particularly helpful on boats with poor lateral stability, including water-jet-powered boats. Humphree, Knipplekullen 3B, 417 49 Gothenburg, Sweden, tel. +46 31 744 3577, fax +46 31 744 3573, website www.humphree.com. In the U.S., Platzer Marine Propulsion, 200 Southwest 6th St., Fort Lauderdale, FL 33301, tel. 954–377–0124, fax 954–467–1159, website www.platzermarine.com. In the early 1970s, Alan Gurney rocked the world of yacht racing with his 73′ (22m) Windward Passage. Alan P. Gurney designed boats the old-fashioned way, with drafting pencil on vellum, using splines and ducks (weights), a planimeter, and a seaman’s eye. He thought like the water through which he had sailed—England, the Atlantic Ocean, the U.S., both polar regions, and much of what lay in between. As a lad, he would make boats out of toilet tissue (which at that time had the characteristics of waxed paper) and float them in his bath. He spurned an army career to pursue yacht designing, and ultimately moved on to an early passion, Antarctic exploration. He amassed an impressive collection of hundreds of photographs of every known Antarctic penguin species. 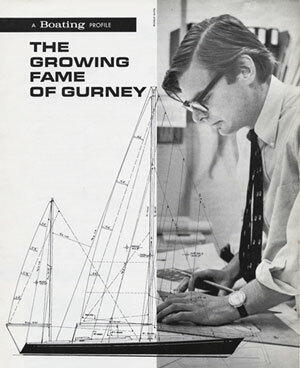 Gurney’s education included a stint as a corporal in the British Army, a design apprenticeship with J. Francis Jones, and work for three years in the West Mersea firm of yacht designer Kim Holman. I had the great good fortune to be Gurney’s friend, and to have had lunch with him frequently as he was in the process of drawing the myriad details of what was to become Windward Passage, the famous dream boat of lumber tycoon Robert F. Johnson. During each lunchtime visit I would meet Gurney in his basement studio on New York’s East 54th St. and he would show me the most recent drawings. I met Gurney in 1960, following that year’s Bermuda Race. I was a yacht broker in the office of Tripp & Campbell in New York City when Englishman Gurney was brought around by G. Colin Ratsey (of the English sailmaking firm) to meet yacht designer Bill Tripp [see “Bill Tripp’s Boats,” PBB No. 105]. Later, the firm offered a job to Gurney. Tripp, frustrated that the time he spent commuting from Long Island to the city could have been spent working out of his home, left the partnership in 1962, offering to take Gurney with him, but he declined. Gurney was left on his own, working with yacht broker William B. Campbell out of the former Tripp & Campbell offices in Rockefeller Center. The 73′ (22m) Windward Passage set the offshore racing world alight. In 1971, under command of Johnson’s sons, she set a course record in the Miami–Montego Bay race, which stood for 30 years and was eclipsed only when the offshore racing rules permitted larger boats than the previous 73′ overall length to which Passage had been limited. Later that year she shattered the elapsed time record for the San Francisco–Hawaii Transpac race. Gurney also designed Great Britain II, a 77-footer (23.5m) similar to Windward Passage, for Chay Blythe, and it won the Whitbread Round the World race in 1973–74. Except for the well-received O’Day 27 and Islander 36, series production boats that would have assured royalties over the years eluded Gurney. Custom work, although prestigious, meant starting over with each new client. Unable to devote sufficient time to work with all the custom clients who wanted his services, unwilling to take on the responsibility of a staff, and disillusioned by the trend toward unsavory, unseaworthy offshore racing boats, Gurney left his yacht design business and took an Antarctic cruise on the Lindblad Explorer. At the end of the cruise, he signed up for the next one. He was hooked on what was to become a second career. His second book, The Search for the White Continent, chronicles the voyages of actual discovery and supposed sightings of the Antarctic Continent in which he found justification for many claims of discovery, and debunked others of dubious merit. The Compass, his third book, is a detailed history of the development of this basic navigation tool that made possible the early voyages of discovery and continues to be the most essential navigation tool of mariners today. It is a must-read for all who venture forth and need to know where they are headed. Diagnosed with terminal esophageal cancer in April 2012, he left this life barely three months later, on July 22. I miss Alan Gurney as a friend. The world of sailing and scholars of maritime history have lost a brilliant star whose light they can now appreciate only through the sailboat designs and published histories he has left behind. If you’ve worked in the marine industry—in the field, as a boat builder, or service mechanic—then you’ve probably assembled pipe, and lots of it. Fuel, raw water, potable water, sanitation, wash-down, and other plumbing systems typically rely on a combination of threaded pipe, pipe fittings, and hose. Tapered pipe threads are common in the trade, and while they are designed, in theory, to be self-sealing, the fact is they rarely are, as anyone who has assembled them without the benefit of thread sealant has discovered. While many arguments can be made against the use of tapered pipe threads in these and other systems, it’s safe to say that we’ll be installing, servicing, and repairing them for the foreseeable future. When it comes to thread sealant, some would say it’s a necessary evil; every gearhead has his or her favorite, and I’m no exception. I’ve tried a dozen or so products over my career in the industry; some I’ve loved, and others I could do without. 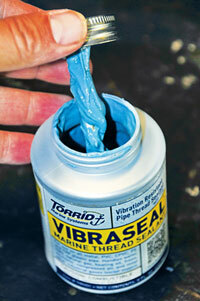 So I was interested when the folks at Torrid, a Seattle-based manufacturer of water heaters, contacted me about testing a new thread-sealant they were marketing called Vibraseal (not to be confused with Loctite’s water-based Vibra-Seal). Torrid has been using this thread sealant for several years on products they manufacture. When initially sourcing it, the company was looking for something that was resilient, approved for use with potable water, and above all else, vibration resistant. Ideally, the goal was to find something that offered the benefits of polytetrafluoroethylene (PTFE, or Teflon) thread sealant, along with corrosion and vibration resistance. Working with chemical manufacturer RectorSeal and its design team, they came up with a formula that offers all these attributes as well as improved adhesion and flexibility. Vibraseal is ideally suited for potable-water applications throughout a boat and is National Sanitation Foundation (NSF) approved. However, it’s also fully compatible with, among other things, diesel fuel, hydraulic fluid, gasoline, and compressed air. Available in the ubiquitous brush-on-lid, plastic, 8-oz (237-ml) containers, its blue-green ketchup-like consistency is easily applied to threads up to 1¼” (32mm), and larger sizes by following special instructions provided on the container. Its key attribute is its nonhardening, permanently flexible formula, which makes it especially resistant to vibration, and it’s suited for use on all metal, PVC, CPVC, PE, and FRP NPT pipe threads. Torrid Marine, 10766 Myers Way South, Seattle, WA 98168 USA, tel. 800–722–5123, website www.marinewaterheaters.com. Phil Friedman, onetime CEO of Palmer Johnson Yachts and presently a new-build and refit consultant with Dwight Tracy & Friends Yacht Sales (Fort Lauderdale, Florida), has written a short e-book titled Ten Golden Rules for Successful New Build Projects. From his long career as a designer, builder, project manager, and administrator, he synthesizes that hard-won knowledge so others might avoid the many pitfalls that seem part and parcel of any large-yacht construction project. An example of the importance of specificity in the contract language is nicely revealed in a not-uncommon yard practice of fudging payment milestones. One such milestone is “setting propulsion engines.” Yards strapped for cash, he says, may temporarily install engines, collect the milestone payment, and then remove the engines to install equipment that should have gone in first, such as tanks and plumbing. The two pages of Rule 5 explain how the mishandling of allowances can sour the deal for builders and clients alike, and Rule 6 discusses the sticky wicket of change orders. Most managers involved in big-yacht builds, whether employed by the yard or the client, will no doubt have cogitated Friedman’s rules long before now and learned their lessons the hard way. Still, for the few minutes it takes to read this e-book, one might come away with a new resolve to do better next time. And anyone mentoring someone new to the business would be wise to e-mail a copy of Ten Golden Rules. A free copy, as a PDF file, is available by e-mailing Friedman at Phil@nullportroyalgroup.com. On the shop floor a fiberglass interior pan is prepped for installation in the adjacent hull of a Harbor 30, the latest in W.D. Shock’s Harbor series. Principal specifications: LOA 30′ (9.1m), LWL 26′1″ (7.9m), beam 9′11″ (3m), shoal draft 4′10″ (1.5m), deep draft 6′3″ (1.9m), displacement 7,500 lbs (3,398 kg), ballast 3,300 lbs (1,495 kg), sail area 535 sq ft (50m2). 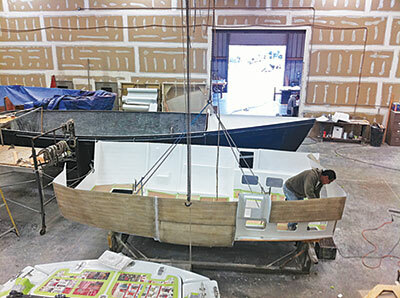 One of the oldest fiberglass boatbuilding companies in the U.S., the W.D. Schock Corp., seemed assured of continuing on indefinitely when it was bought last year by a longtime fan, Alexander Vucelic von Raduboj. As a child growing up in Southern California, Vucelic von Raduboj’s first boat was a Schock-built Naples Sabot, one of many daysailers that W.D. “Bill” Schock built over a lifetime in boats. Schock designed the Lido 14 in 1958, which was an instant success, eventually selling more than 6,000. Larger designs by Gary Mull and Shad Turner followed, including the Santana 22, 27, 37, and more. Eventually, the W.D. Schock Corp. employed 300 people, though it has been many years since it has seen that number. It diversified into nonmarine products such as manhole covers, hospital operating tables, airplane cockpits, and trailer bodies. Schock died in 1991, leaving the company to his three sons, who ran it until last year. 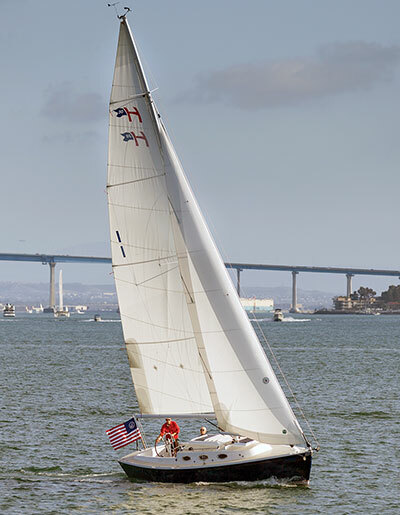 One son, Steven Schock, is a naval architect and the designer of the company’s latest model, the Harbor 30 (9.1m), a daysailer (with berths and modest cruising amenities, prompting the Schocks to call it the Daysailer Plus) akin to the Alerion Express, Morris 29 (8.8m), and other smart sailing sloops that often appeal more to yacht owners coming down in size rather than moving up. It joins the Harbor 14, 20 (6.1m), and 25 (7.6m), which have enjoyed brisk sales in fleets around the country. Construction is E-glass and vinylester resin with carbon fiber reinforcement in selected areas. In way of deck hardware, the balsa core is removed and replaced with G10. Lead ballast is encased in a fiberglass shell and bolted to the hull, which is strengthened with a one-piece molded grid of floor timbers and stringers. System Three’s SA-2100 sealant/adhesive is a two-part aliphatic polyurethane that remains flexible, isn’t affected by UV, and cleans up with soap and water. System Three, maker of resins for the marine industry and others, recently introduced SilverThane SA-2100, a sealant/adhesive it says is unique—namely, an aliphatic (linear) polyurethane that is not affected by UV radiation, remains permanently flexible, has a fast through-cure in any thickness, won’t yellow or sag, has an extremely long shelf life, is waterproof, takes paint, doesn’t shrink, and cleans up with soap and water. Similar marine sealants, such as 3M 5200, says System Three’s Kern Hendricks, are aromatic isocyanates, requiring moisture in the air to cure, meaning they begin curing as soon as the tube is opened. Leftover product in the tube is often unusable. 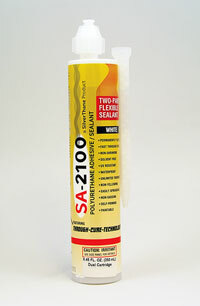 Because aliphatic polyurethanes won’t cure with moisture, a two-part system is necessary; in this case, the alcohol groups on each molecule in the Part B.
SA-2100 can be applied as an adhesive that is very difficult to remove, as an adhesive to one side of two surfaces and as a sealant on the other, and as a gasket material that bonds to neither. System Three’s application guide advises that prior to applying the product, the user determine if future release is desired. Once determined, surface preparation of the two bonding surfaces varies with the desired bond. The guide is very straightforward regarding which materi­als the sealant/adhesive bonds well with and which ones it doesn’t. No special surface prep is needed for any wood, stainless steel, mild steel, polycarbonate, or epoxy or polyester resin. The guide says it bonds poorly to untreated aluminum but “extremely well” to acid-etched aluminum. The bond to copper, brass, bronze, and zinc “is fair to poor,” as it is with Delrin, polystyrene, ABS, PVC, and acrylics; this latter group, however, can be flame treated (quickly passing a torch 5″/127cm or so above the material’s surface) for a “very good” bond. SA-2100 is available in several size cartridges; the 8.45-oz (250-ml) cartridge sells for $19.95, available from dealers or online. System Three, 3500 W. Valley Hwy N, Suite 105, Auburn, WA 98001–2436 USA, tel. 253–333–8118, website www.systemthree.com.